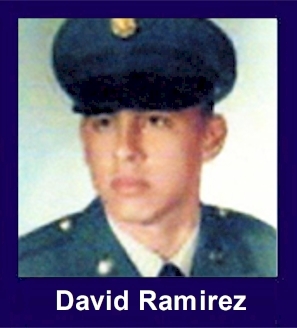 The 35th Infantry Regiment Association salutes our fallen brother, PFC David Thomas Ramirez, who died in the service of his country on March 1st, 1967 in Binh Dinh Province, Vietnam. The cause of death was listed as Small Arms/AW. At the time of his death David was 21 years of age. He was from Sanger, California. David is honored on the Vietnam Veterans Memorial at Panel 15E, Line 129. The decorations earned by PFC David Thomas Ramirez include: the Combat Infantryman Badge, the Bronze Star with V, the Purple Heart, the National Defense Service Medal, the Vietnam Service Medal, the Vietnam Campaign Medal and the Vietnam Cross of Gallantry with Palm Unit Citation. Killed with David was Ted Reid. David was to be the best man in Ted's wedding after their Vietnam service was done. For heroism in connection with military operations against a hostile force. Private First Class Ramirez distinguished himself by heroic action on 1 March 1967 while serving as a Machine Gunner for the Reconnaissance Platoon of the 1st Battalion, 35th Infantry, during a search and destroy mission in the Republic of Vietnam, when it made contact with an estimated reinforced North Vietnamese company size force. Private First Class Ramirez, was given the order to cover the platoon's right flank; the point of heaviest contact. Private First Class Ramirez maneuvered under intense hostile fire, with completer disregard for his own personal safety, to a position where he could effectively support his platoon. For more than an hour, Private First Class Ramirez covered the platoon's right flank and stopped several attempts by the enemy to penetrate the platoon's perimeter. While awaiting the impending air strike, two North Vietnamese soldiers with automatic weapons made a final attempt to exploit the platoon's right flank. Private First Class Ramirez immediately opened fire on the approaching enemy, eliminating them both and routing four others who had previously gone unnoticed. Private First Class Ramirez was fatally wounded during this action. His alertness and his decisive actions were instrumental in preventing the right flank of the platoon from being overrun. Private First Class Ramirez's outstanding display of aggressiveness, devotion to duty, and personal bravery is in keeping with the highest traditions of the military service and reflects great credit upon himself, his unit, and the United States Army.